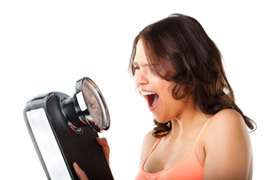 With all the media coverage of the latest diets the super-skinny celebrities are using, its not surprising that so many people fall in to the trap of diet-hopping, with an outcome of heightened mental frustration as opposed to long-term weight loss success. People get drawn into new 'fads', with the promise of 'quick', 'instant', 'guaranteed' results, but these are often centred around drastically reduced calorie intake as opposed to sensible, healthy eating. These diets cause short-term water and lean muscle tissue loss, giving the illusion of effective weight loss. Lean muscle tissue is metabolically active, meaning that the more lean muscle tissue an individual has, the more calories are burned. The reduction in lean muscle tissue reduces the body's ability to burn fat. This is where the 'yo-yo' term becomes relevant because, once the body adjusts the metabolism to the reduced calorie intake or the 'normal' calorie intake is resumed, any initial weight loss is often regained. It is also common for individuals to end up gaining more weight then prior to the diet because of the 'famine strategies' employed by the body during the restrictive period. Starvation strategies - kick in with low calorie diets and result in increased levels of lipoprotein lipase in the body (an enzyme responsible for transferring fat into the bodies fat stores), so the body starts storing calories away as fat as protection against further 'starvation'. The psychological frustration caused by what seems like a backward step often drives individuals to try another drastic 'solution' to turn things around and achieve results quickly. The result is a vicious cycle of yo-yo dieting! Mental/emotional frustration - which vents itself in mood swings, low self- esteem and disordered eating. Numerous studies link chronic dieting with feelings of depression and increased stress, anger and bingeing. A higher risk of heart disease and some cancers then individuals whose weight remains stable if even overweight. This is due to reduced levels of specialised immune system cells. Long-term fatigue of an individual's metabolic rate. Increased risk of osteoporosis, fractures and broken bones - due to the nutrient deficiencies common in calorie restricted regimes. Loss of muscular strength and endurance and loss of co-ordination. Fainting, weakness and slowed heart rates. Issues with memory as the stress and anxiety about food and weight can actually consume a significant portion of a dieters working memory. Dieting can in some cases lead to an eating disorder as a result of body dissatisfaction and constant concern with bodyweight and shape, fat grams and calories. The solution to permanent weight loss: consume enough energy to burn fat and eat the right foods to maintain lean muscle tissue. A sensible, balanced diet and moderate exercise gives real, long-term results.